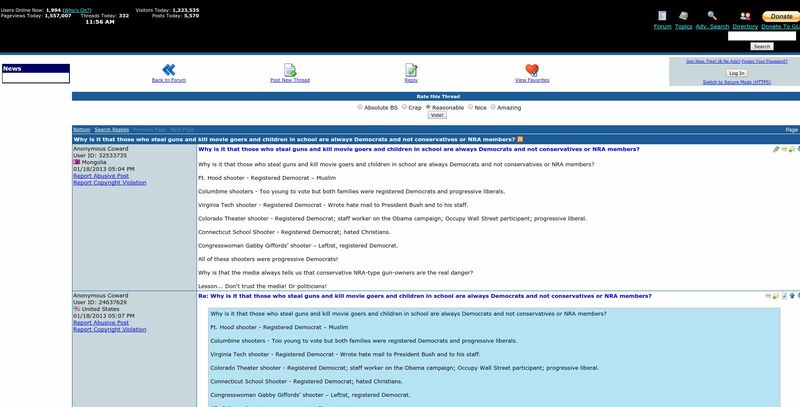 A viral list charts dozens of shootings and assassination attempts purportedly committed by Democrats. 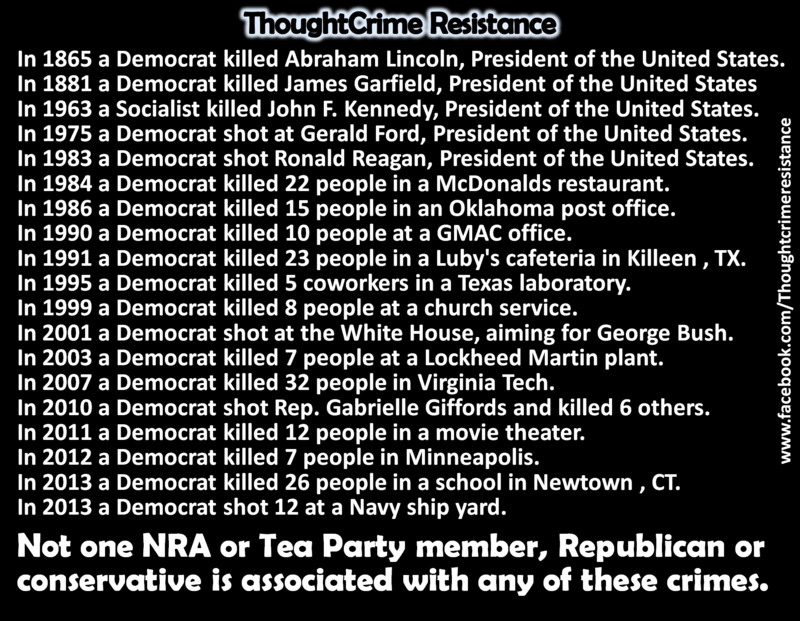 A meme accurately lists Democrats who have been involved in assassinations, assassination attempts, or mass shootings. In 1881 a left wing radical Democrat shot James Garfield, President of the United States – who later died from the wound. *Not one *NRA member, Tea Party member, or Republican conservative was involved in any of these shootings and murders. *SOLUTION:* *It should be illegal for Democrats to own guns. *Best idea I’ve heard to date! This list has evolved since it first started circulating in the wake of the Sandy Hook shooting in 2012. The earliest iteration of this list we could uncover only contained five items, but as it spread people added new names and dates and removed old ones that were either irrelevant or disproven. The earliest versions of this list reveal two things: It has always been rife with errors (Lincoln’s alleged death-by-Democrat was originally listed in 1863, not 1865), and has always circulated with an anti-Democrat, pro-NRA message. SOLUTION: It should simply be illegal for Democrats to own guns. Setting aside for a moment the accuracy (or lack thereof) of the items on the list, there’s a logical flaw in using this meme to reach the conclusion that Democrats shouldn’t own guns — or that National Rifle Association members, tea party members, or Republicans are less likely to be involved in assassination attempts or mass shootings. This list is not comprehensive. It does not include all of the shootings that have occurred in the United States, nor the political affiliations of every shooter. It ignores shootings committed by Republicans, as well as those with no political party affiliation, and makes no attempt to show how political affiliation leads to violence. In other words, one could make a similar list naming nothing but Republican or politically unaffiliated shooters in order to make the opposing (and still flawed) argument that those groups should not own guns. In addition to the logical problems of this meme, much of the information is also inaccurate. We searched contemporary reports for each of the listed incidents in an attempt to uncover any mentions of political affiliations, motivations, or voting records. Many of these items can be traced back to poor reporting, articles that were later corrected, or fake news items. And although we encountered this meme (or a similar list) on a variety of web sites, none of these publications provided any documentation to back up these claims. Verifying this information through online state voting registrations proved problematic as deceased individuals are removed from these databases. We reached out to state historical societies for additional documentation, but several of the states we contacted told us that voter registration records weren’t archived. Even if they were, however, one’s official party registration can often contradict one’s political beliefs. Given the difficulty of finding the political affiliation of many of the individuals on this list, we are highly skeptical that this list is based on credible information. Those ideological differences include increasing the power of the federal government and emancipating the slaves, both things Booth was vehemently against. He was angered that the government instituted an income tax and the military draft, and that the government occasionally suspended habeas corpus, a legal protection against unlawful imprisonment. All these things, Alford says, agitated Booth. Although Booth’s motivations may have aligned with the Democratic party of 1865, they bear little resemblance to the party’s modern positions, which have changed dramatically over the past 152 years. After the election, Guiteau moved to Washington to collect his imagined prize. These were the days when any ordinary citizen could pay visits to officials. Guiteau roamed the halls of the State Department and White House, imploring anyone who would listen that he deserved a diplomatic post. The words stung, and set Guiteau off on a bizarre chain of logic, which would result in his demise. Blaine was a menace to the Republican Party. To get rid of Blaine, he reasoned, he had to kill the president. After all, it was Garfield’s fault that such a man served in the State Department. Guiteau heard these instructions from God himself. It wouldn’t be an assassination, but a divinely ordained “removal.” The plan was essentially motiveless, as the the death of the president wouldn’t stand to benefit Guiteau or any Republican. “In the president’s madness, he has wrecked the once Grand Old Republican Party; and for this, he dies,” Guiteau wrote in a letter of admission. Guiteau was not a “left wing radical Democrat” — he was a supporter of the Republican Party. Oswald was a Marxist and supported Fidel Castro and Cuba. However, Oswald’s inclusion on this list is odd in that there is no claim that he is a Democrat. One interpretation of Moore’s assassination attempt is that she had made a choice between the two sides—she had decided to throw her lot in with the leftists and wanted to demonstrate her allegiance. In the days before she shot at Ford, Moore called up the San Francisco Police Department and told the officers there she was considering a “test” of the president’s security system. They took away her gun; she bought another one, and with that gun in her car, sped through downtown in the hopes, she later said, of being apprehended. While she stood waiting to fire her shot, she was thinking about whether she’d be on time to pick up her son. Another claim that seems to be supported only by speculation. John Hinckley Jr.’s assassination attempt in 1981 (not 1983 as suggested by this meme) was motivated not by politics, but by his desire to woo actress Jodie Foster. In fact, officials believe that before he shot Reagan, Hinckley stalked Jimmy Carter towards the end of his presidency. We wouldn’t have voting records in our collection at all. If their affiliation happened to be mentioned in a newspaper article, we might have that, but as the relevant years for Hinckley aren’t digitized (nor do we have digital access for current Denver Post content), it would be extremely difficult to find. We also contacted the Colorado State Archives, but they didn’t have a record of Hinckley’s purported political affiliation either. 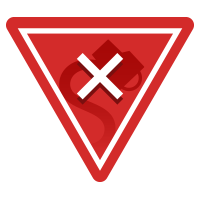 As a self-proclaimed survivalist, Jmes Huberty saw signs of trouble in America, which was on the brink of ruin, in his view, because of government meddling and overregulation that ruined businesses, including his own. He also believed that the country was headed for disaster because a cabal of international bankers purposefully manipulated the federal reserve system, which bankrupted the nation. To prepare for the inevitable apocalyptic collapse, he also collected a half-dozen guns, including those he brought with him to the McDonald’s restaurant that afternoon. Huberty attempted to contact a mental health facility the day before he killed 22 people in a McDonald’s. Reports about the 1986 shooting which left 15 people dead and led to the popularity of the phrase “going postal,” paint Sherrill as a “loner” whose eccentric behavior earned him the nickname “Crazy Pat.” He was a marine and a member of the National Guard. Patrick Henry Sherrill was a mediocre postman. After 16 months as a part-time letter carrier for the post office in Edmond, Okla. (pop. 47,000), Sherrill was still receiving complaints from his managers about misdirected mail and tardy performance. Last week, after two supervisors reprimanded him, Sherrill told a local steward for the American Postal Workers Union that he was being mistreated. “I gotta get out of here,” he said. James Pough went into the office of the General Motors Acceptance Corporation, the car company’s financing arm, in Jacksonville, Florida, fatally shot 9 people and killed himself. We found no record of James Pough being registered with any political party. Although a motivation for Pough’s shooting spree is still unclear, reports at the time mentioned that his car had been repossessed. In 1991, George Hennard, a disgruntled Democrat, shot and killed 23 people in a Luby’s [C]afeteria in Killeen, TX. Again, we found no evidence that Hennard was a registered Democrat. Simpson, who killed five people at an oil refinery where he used to work, does not appear to have been motivated by politics. We also found no evidence that he was a Democrat. For this, and all other Texas shootings on the list, we contacted the Texas Historical Commission, who directed us to the Texas Secretary of State’s office, from whom we have not yet received a response. Again, we are skeptical that whoever put this shooting on the list found evidence that Simpson was a Democrat. The most intriguing new detail came from Houston writer and private investigator John Craig, who said he had interviewed Ashbrook in the presence of several Ku Klux Klan members in spring 1997. Co-writer of a book on white supremacists, Craig said that Ashbrook boasted of his membership in the Phineas Priests, a loose-knit, virulently racist movement that advocates the killing of minorities and Jews. Buford Furrow, who allegedly shot up a Jewish day-care center in Los Angeles in August, is also believed to be a Phineas Priest. Doug Davidoff, spokesman for the Indiana Democratic Party, said public election records showed Pickett registered to vote in 1992 but did not cast a ballot and has not voted since. In Indiana, where Pickett registered to vote, the voter registration form does not offer the option to register as the member of a political party. Instead, for the purpose of political primaries, voters affiliate with a party based on their vote in the last election. Since Pickett never voted, he was never officially a member of any political party. Some of Doug Williams’ co-workers said they were not surprised to hear that he was the man who blasted away with a shotgun at a Lockheed Martin factory near Meridian, Miss., before shooting himself. Four of the five people he killed were black. Some co-workers said Williams, who was white, had made racist remarks. But authorities said it appeared Williams shot people at random. Seung-Hui Cho was not a registered Democrat. Cho was born in South Korea and was a legal resident alien of the United States, which makes it exceedingly unlikely that he was registered to vote in Virginia. Furthermore, Virginia does not have partisan voter registration, so even if Cho had been registered, he would not have been registered as a Democrat. Jared Lee Loughner was a registered as an Independent in 2006 and did not vote in 2010. Newly-released information on the suspect’s birthdate (which, as indicated in our initial report, was a slight mismatch), combined with new details Breitbart News has obtained about the suspect’s likely addresses, together suggest that the suspect may, in fact, not have been registered to vote. We found no record of Holmes’s political affiliation, if he indeed had any. We found no evidence that Engeldinger was a registered Democrat, and his shooting does not appear to have been politically motivated. The Minnesota Historical Society Library told us that they do not maintain records for individual voters. We did, however, once again find reports that the shooter was mentally unstable. Andrew J. Engeldinger’s descent into darkness began two years ago, but even as he retreated from family and bought handguns and ammunition, he kept coming to work at the Accent Signage Systems factory in Minneapolis. But in recent years, Engeldinger’s family began worrying about what appeared to be his paranoia and delusions. Two years ago, his parents attended a 12-week “Family to Family” class offered by the Minnesota National Alliance on Mental Illness. The class is taught by family members of mentally ill people. His family hadn’t had contact with him for about 21 months after he had shown signs of possible mental illness, said Sue Abderholden, executive director of the Minnesota National Alliance on Mental Illness. They were trying to get him to seek treatment; they did think something was wrong,” she said. But Engeldinger didn’t appear to be a threat to himself or others — criteria for petitioning for commitment to mental health care, she said. Adam — 5-feet-10 and thin, with blue eyes, according to his driver’s license — had become a vegan and insisted on eating organic food. Family friends said he was politically conservative, although he was the one member of his immediate family not registered to vote. Furthermore, Lanza’s inclusion on this list is problematic as police found an NRA shooting guide at his home and an NRA certificate in Lanza’s name. The government contractor who killed 12 people at the Washington Navy Yard last week was driven by delusions that he was being controlled by low-frequency radio waves and scratched the words “End the torment!” on the barrel of the shotgun he used, the FBI said Wednesday, offering new, chilling details of the attack. This viral list has been published by a wide range of outlets. However, none of those publications provided any documentation to prove that these individuals were all Democrats. Our investigation found that the majority of people on this list had no official connection to a political party, and that the majority of the incidents were not motivated by politics. Correction: : A previous version of this article mistakenly stated that neither Moore nor Fromme fired a shot at Gerald Ford. The Washington Post. 25 September 2013. Star Tribune. 29 September 2012. CBS News. 11 January 2011. The Florida Times-Union. 14 March 2013. ABC News. 12 May 2005. The New York Times. 8 February 2001. CNS News. 7 July 2008. Los Angeles Times. 18 September 1999. The New York Times. 20 June 1990. New York Post. 15 August 2010. Brown, Ronald. Dying on the Job: Murder and Mayhem in the American Workplace. Rowman & Littlefield Publishers, 2012. ISBN 1442218436. The Hollywood Reporter. 27 July 2016. The Red State. 28 March 2010. The Atlantic. 4 October 2015.